The Italia Pizza Accessories Kit gives you everything you need to bring out your inner artisan pizza chef. 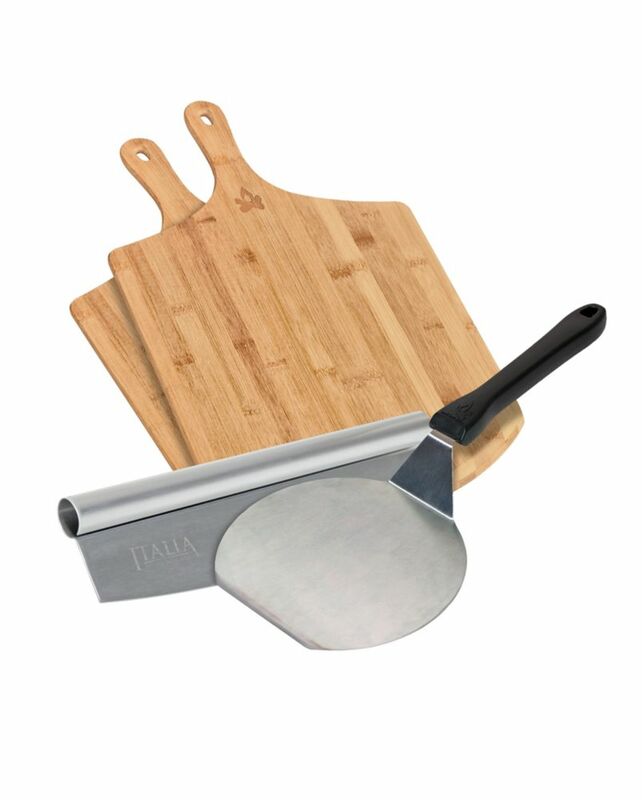 You get two pizza peels and a spatula for easy pizza handling. Plus, the Rocking Pizza Cutter makes slicing and serving a breeze. Get yourself ready for pizza night this week with the Italia Pizza Accessories Kit. Ideal for camping, hiking, sightseeing, at the theater, or watching sporting events of all kinds, the Olympus 8x21 Roamer DPC I Binocular is a full-featured optic for active outdoor enthusiasts and travelers.Compact and lightweight, the Roamer lives up to its name by being easy to pack and carry, giving you the freedom to roam wherever you wish. This model is outfitted with a moderate magnification with a space-saving reverse Porro prism light path to make it comfortable in the hand while providing a rich depth of field. Aspherical lenses, ultraviolet protection, and anti-reflection coatings help to enhance the view and eliminate distortion while protecting your eyes from harmful radiation from the sun. Rubberized palm pads provide a slip-resistant grip for sure handling, and the included neck strap allows you to keep ready for fast glassing on the go. Pizza Accessories Kit The Italia Pizza Accessories Kit gives you everything you need to bring out your inner artisan pizza chef. You get two pizza peels and a spatula for easy pizza handling. Plus, the Rocking Pizza Cutter makes slicing and serving a breeze. Get yourself ready for pizza night this week with the Italia Pizza Accessories Kit. Pizza Accessories Kit is rated 5.0 out of 5 by 3. Rated 5 out of 5 by Overhill from Nicely made tools Had pizza while camping without electricity. The new tools made it easier and a lot of fun. Rated 5 out of 5 by salvagetim from I'm a pizza maker! I bought the pizza kit before my last camping trip and everyone thought I was a professional pizza maker! Rated 5 out of 5 by Anne Marie from Works Fantastic! The pizza kit is perfect! I would highly recommend anyone with the Camp Chef Pizza Oven to purchase the kit.